The Patient Protection and Affordable Care Act (ACA) is one of the most important, but controversial laws of our generation. Yet despite all the contentious debate over the law and its impact on millions of Americans, the ACA remains a mystery – dense, complex, and generally misunderstood. Even two months after its official rollout, a majority of Americans say they still don&apos;t understand the very basics about how the ACA impacts them. For young people, that trend is even more pronounced. Millennials – the generation of Americans between 18-35 – are critical to the success of the ACA. Because young people are typically healthy and rarely rack up expensive medical bills, the White House is counting on at least 2.7 million young Americans to sign up for health insurance to offset the cost of the ACA. Yet, 27% of millennials do not have insurance – the highest rate of any demographic – and 42% of young people have not even heard about their state health exchanges. The ACA remains controversial for young people, as it does for everyone else. On one hand, 70% of young people are optimistic about the ACA&apos;s future. On the other hand, opponents say the law rips off young people by forcing our generation to pay higher premiums to cover the medical costs of older, sicker Americans. Which is it? Is the ACA a good deal for young people, providing better coverage that will make our generation healthier for the long-term? Or should our generation be marching in the street over the law due to its long-term financial costs? We&apos;re here to explain, in plain English, what the ACA means for young people, so you can make that decision. From the policy to the controversy, we outline below everything you need to know about the ACA as an 18-35 year-old. So what exactly is the Affordable Care Act? The U.S. has one of the least efficient health care systems in the developed world, meaning we spend the most on health care per capita of any country while simultaneously getting the worst outcomes. The ACA – passed by Congress and signed into law in March 2010 – represents President Obama&apos;s attempt to change this. The law reforms how insurance companies provide health insurance coverage and represents the single largest overhaul of the American health care system since the passage of Medicare and Medicaid in the 60&apos;s.
The most important provision of the ACA – and the one challenged in the Supreme Court – is called the "individual mandate" and requires all Americans who can afford health insurance to purchase a policy or pay a tax penalty for failing to do so. This provision affects approximately 26 million Americans who are currently uninsured. Boiled down, the individual mandate requires all Americans, young people included, to have some form of insurance coverage by March 31, 2014. Failure to do so will result in a fine of $95 or 1% of your income – whichever is higher – in 2014. That fine increases to $325 or 2% of income in 2015 and $695 or 2.5% of your income by 2016. To offset these costs, however, the ACA also expands federal funding for Medicaid, which could benefit almost 8 million young people who are currently either unemployed or earning less than $15,000 per year. The law also offers subsidies to Americans who fall below a set income threshold. Young people will be eligible for subsidies if their modified adjusted gross income is less than 400% of the federal poverty level ($45,960 for a single person in 2013). Families USA – a non-profit which supports the ACA – estimates about 9.3 million people between 18-34 will qualify for a subsidy. In total, about a third of the 26 million uninsured Americans will qualify for Medicaid coverage at little to no cost, and another third will qualify for subsidies to purchase insurance. That leaves about 7.3 million people, or 3% of the population under age 65, who are not offered financial aid and will be subject to penalties if they do not sign up for coverage. There are several other key provisions of the ACA for millennials. First, the law allows young people to remain on their parents&apos; health insurance plans until the age of 26. For young artists, start-up entrepreneurs, contract workers, and many others, this represents a significant change. The Department of Health and Human Services estimates more than 3 million young adults have taken advantage of this provision since 2010. Second, the ACA requires health insurance companies to provide more comprehensive coverage. All individual plans will now be required to cover certain essentials, including: preventive care, hospitalization, maternity and newborn care, emergency-room care, and broader prescription drug coverage. The law also prohibits some of the worst abuses of insurance companies, such as denying coverage on the basis of a pre-existing condition, raising rates after people get sick, and canceling an existing policy to avoid paying claims. Third, the law requires businesses to provide minimum health coverage to their employees, meaning the vast majority of Americans will now receive insurance through their jobs. Employers will be required to offer "adequate" health insurance plans – defined as covering at least 60% of the average health care costs in their area. If your employer does not offer affordable coverage (equivalent to 9.5% of your income or less), you&apos;ll be able to purchase an individual insurance plan to get a better rate. Finally, the law offers a number of changes specific to young women. Insurance companies can no longer charge women more because of their gender. In addition, coverage plans must now include preventive services free of copays or coinsurance, including mammograms, birth control, and STD screenings. Plans must also provide for maternity and newborn care, such as counseling, screening, and vaccines to ensure healthy pregnancies. However, there will be limits on coverage for abortions; for example, individuals with subsidized coverage cannot use federal subsidies to pay for an abortion. If you already have health insurance, whether through your parents, your school, your job, or the individual market, you&apos;ll generally be unaffected by this law. For those who are uninsured, the ACA sets up state and federal health care exchanges – online marketplaces for purchasing insurance. Most exchanges are expected to be state-run, regulated online marketplaces, where you can compare plans and costs from multiple insurance companies, find out if you qualify for financial assistance, and purchase a plan that&apos;s right for you. If your state is not running its own exchange, the federal government will run it for your state through HealthCare.gov. According to the Kaiser Family Foundation, 16 states and Washington, D.C., are setting up their own exchanges, 27 states have decided to let the federal government run their exchange, and seven states are setting up a "hybrid" exchange in which the state and federal government share authority (more below). The plans sold on the exchanges are categorized as bronze, silver, gold, and platinum, depending on how much of a person&apos;s medical expenses they cover. The higher the level, the greater the coverage and higher the premiums will be. In general, the bronze plan should be sufficient for most healthy young adults, but individuals who often get sick or have chronic conditions should consider plans which cover additional medicine and hospital visits. One additional option exists for people younger than 30: a catastrophic coverage plan. These policies are geared toward young, healthy people who want a minimum level of coverage for emergencies but don&apos;t want to spend much on health insurance. They have lower premiums but higher deductibles, meaning medical expenses are largely your own responsibility, outside of three primary care visits a year. Here is a list of all the states with their own exchanges and information on how to access them. If you live in a state that&apos;s not listed, you need to shop for health insurance through the federal exchange at Healthcare.gov. So when does the law take effect? The ACA was signed into law in 2010, but the key date is March 31, 2014, the last day you can enroll to avoid penalties. After this date, you&apos;ll have to wait until 2015 to sign up for a plan. Remember, the tax penalty for not signing up is $95 for 2014, and will increase in 2015 and beyond. Starting in 2014, your federal tax returns will include a new form where you&apos;ll be required to detail your source of health insurance. If you don&apos;t carry coverage – and fall within the group of people covered by the individual mandate – you&apos;ll get hit with the penalty. Important to note for young people on their parents&apos; plans, your coverage will automatically end on your 26th birthday, which will trigger a special enrollment period. You&apos;ll have less than three months to find and start new coverage – either from your employer or from an exchange – or else you&apos;ll pay the penalty. What happens if you don&apos;t buy insurance and you don&apos;t pay the penalty? As of now, not much. The law specifically says no criminal action can be imposed on people who don&apos;t pay the fine, which makes enforcement of the law limited. The only way the IRS can collect your penalty payment is by deducting the amount from your tax refund on your income taxes. Congress could change that if too many people aren&apos;t buying insurance and avoid paying the fine. It&apos;s the golden – or in this case, bronze, silver, and platinum – question. The stakes are very high for young people to sign up for health insurance. If the exchanges do not sign up approximately 2.7 million young people, they&apos;ll have to raise premiums or limit the number of plan options available in 2015 for everyone else. Millennials are typically healthy and rarely rack up high medical bills, so their monthly premiums will make it cheaper for the federal and state exchanges to insure the 4.3 million other Americans who will dominate the exchanges. A key provision of the ACA sets a limit on how much insurance companies can charge older people – premiums for a 64-year-old can only be three times as much as they are for a 21-year-old. This could raise the cost of insurance for some young people. Many will qualify for either Medicaid or tax subsidies, however, and won&apos;t have to pay the full price. For example, according to the Kaiser Family Foundation, the monthly premium for a single 25-year-old in Seattle with an annual income less than $28,725 to sign up for a bronze plan drops from $167 to $138 after subsidies. Between subsidies and Medicaid, the government estimates about two-thirds of young people will pay a monthly premium of less than $100 for coverage under the ACA and nearly half of adults under 30 will pay less than $50 for coverage. The bottom line is the cost of your coverage will vary depending on where you live, how much you make, and how you get your insurance. If you already have health insurance through your job, your premiums will depend on which health insurance company your employer decides to use and how much your boss will cover the difference if premiums go up. Meanwhile, if you&apos;re planning on getting health care through the exchanges, here&apos;s a handy calculator to give you an estimate of what health insurance may cost through the ACA exchanges. Setting aside the technical issues with the rollout of HealthCare.gov, the bulk of the criticism of the ACA for young people boils down to two core issues: the provision requiring young people to cover the costs of older people and the long-term fiscal costs associated with this law. On the former, critics say the ACA creates a transfer of wealth from the young and healthy to the old and sick because of its requirement that premiums for older people can be only three times greater than those for young people. This despite the fact that 64-year-olds use on average six times as much health care as 19-year-olds. 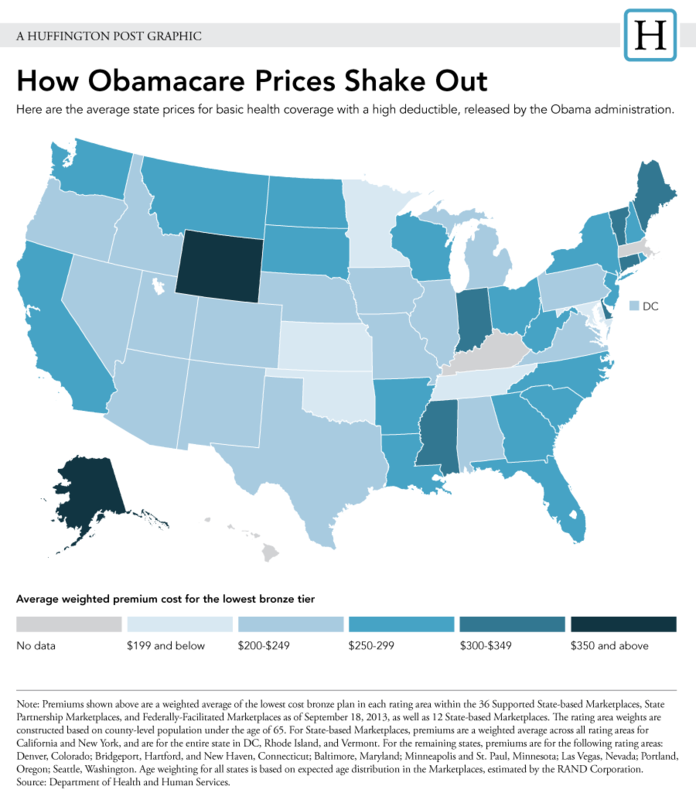 According to the Heritage Foundation, a conservative think-tank, young people will see a larger percentage increase in premiums, and particularly in certain states like Arizona, Arkansas, Georgia, Kansas, and Vermont. Opponents also question whether young people actually need the robust coverage that ACA plans provide. They point out that it may actually be cheaper for young people to pay the penalty for not signing up, than pay higher rates for services that may not make sense for them. Supporters, such as Ezra Klein and Matthew Yglesias, counter that the expansion of Medicaid and government subsidies mitigates these concerns for the majority of young people. They also point out that although young people tend to be healthier, they can easily get sick or injured in an unexpected accident, which would make health insurance necessary. Much like other types of insurance (i.e. car and home), they argue the true value of the ACA only becomes apparent when you need it. Finally, they make the case that young people will eventually grow old, become poor, and get sick too. The same people who are overpaying to keep costs low today will be the people underpaying in the future. But, there&apos;s still a population of young Americans who fall into a gap – those who make too much money for Medicaid and federal subsidies but don&apos;t receive health insurance through their jobs – who could see rates increase. The Wall Street Journal profiled several young adults who are not convinced they should spend on coverage, including a 30-year-old mechanic with a $29,000 annual salary. The cheapest exchange plan for him would cost $147 monthly and include a $6,350 deductible. He also could spend $172 a month on a plan with a $2,500 deductible. He told the Wall Street Journal: "I&apos;m not going to pay for that. It breaks down to: Can I afford it? And, am I getting my money&apos;s worth?" The second major criticism revolves around the long-term fiscal impact of the ACA, which remains uncertain. There&apos;s a great deal of debate around the numbers, but conservatives like Charles Blahous, a former Bush administration National Economic Council official, believe the ACA will add substantially to the federal deficit, placing a greater debt burden on young Americans down the road. He estimates that due to the ACA&apos;s enormous spending commitments on subsidies and Medicaid, the law will add over $1.15 trillion to net federal spending and more than $340 billion to federal deficits over the next 10 years – an amount that will be largely shouldered by millennials and our children. Those numbers are in dispute, however, and supporters point to different numbers, such as the Congressional Budget Office&apos;s (CBO) scoring that the ACA will actually reduce the federal deficit by $109 billion through a mix of spending cuts and tax increases. The CBO estimated in a 2012 letter to House Speaker John Boehner (R-Ohio) that the ACA will reduce the deficit by 0.5% of GDP between 2023 and 2032. Moreover, the ACA&apos;s implementation is having an immediate impact on health care costs in general, with some studies showing that both the rate of inflation in health care costs and the rate of growth for health care spending have reached historic lows. Supporters also argue that the financial cost of maintaining the status quo for young people is even worse – currently, young Americans who experience health problems but don&apos;t have insurance drive up the cost for the rest of society, resulting in one of the most inefficient systems in the developed world. So will young people sign up for health insurance? It&apos;s the big question everyone wants to know: Will young people sign up? Demographic numbers are hard to come by, but initial enrollment estimates from the month of October were troubling: Just 106,000 Americans overall signed up for policies – well below the administration&apos;s original estimate of 500,000. Young people did not make up the majority of those participants, and those numbers are also nowhere near the target of 2.7 million young people (or, more than 38% of enrollees) who need to sign up before March 31 to make this law work. In part, that&apos;s because of the poor performance of HealthCare.gov, a huge implementation challenge. But officials at state insurance exchanges also say they expected older and sicker consumers to sign up first, and younger people to sign up later in the open-enrollment period. The case study for this theory is Massachusetts in 2007, where a similar health care law was enacted by then-Governor Mitt Romney. Just 123 people signed up during the Bay State&apos;s first month of open enrollment, while 20% of the first year&apos;s 36,000 enrollees purchased coverage in the last month before an individual mandate penalty kicked in. Amongst young people under 35, enrollment more than doubled in the final month, and the uninsured rate among young adults fell by more than 60% the following year. The comparison to Massachusetts is not quite accurate, because the state had a much longer open enrollment period of 15 months, compared to just six months for the ACA. But, it&apos;s worth noting that millennials tended to wait until the last minute to sign up. That success also required a strong outreach effort toward the state&apos;s young and healthy; the state launched strong enrollment and awareness campaigns to get millennials to sign up, including the support of the Red Sox. In the case of the ACA, there are some signs that the numbers are beginning to trend in the direction supporters hope for. Despite HealthCare.gov&apos;s obstacles, the website is working much better, and can now handle 800,000 users a day. In turn, November enrollment numbers show young people are starting to sign up for coverage more consistently. Figures from the 14 states running their own marketplaces show that enrollment has climbed to at least 200,000 people nationwide. And in states that have released demographic information, such as Washington, California, Maryland, Connecticut, and Kentucky, 20% of those enrolled so far are ages 19–34. Polls show that 87% of young people consider it "personally important" to obtain health insurance. But while our generation understands the importance of getting health insurance, the outcome of the ACA with young people will depend on how many millennials get educated about this law, and how the criticisms outlined above get resolved. One thing is for sure, there&apos;s a lot more educating to do. A Gallup poll released in August found 36% of young Americans say they are "not too familiar" or "not familiar at all" with the ACA, while only 10% say they are "very familiar" with the law. Another survey from the Commonwealth Fund found that just 25% of millennials are aware of their coverage options through the ACA&apos;s exchanges. Only 27% knew they could begin enrolling in exchanges in October. Among those surveyed, low-income and uninsured young adults were the least informed about this law. So what do you think can be done to educate our generation about the ACA and what it means for millennials? What are the concerns you have about this law that must be resolved to make the ACA work better for you? Share your ideas and proposals in our "Open Mic" here. And, vote for the ideas and proposals you think are smart. The most Mic&apos;d submissions will get a direct response from the White House!